Recently my love of all things coconut-scented has become all-consuming; I love it. I don't have these weird, 'oh I imagine myself on the beach, drinking cocktails on a sun lounger' thoughts, as I hate the beach, I don't drink and sunbathing and my pale skin don't mix well. But give me something that smells of coconut and my frown will turn upside down, for sure. I was sent three items from *Lee Stafford's CoCo LoCo range to review and I've tested them out for a month - I guess to could say I'm loco for coco-nut. That was my attempt at humour, anyway, swiftly moving on. I've used coconut oil and coconut shampoos in the past but they always seems to give my hair far too much moisture and I have to wash my hair the next day. I'm someone who used to wash my hair every other day but for the last two years, I wash my hair every 3-5 days, it's so much better for your hair (and it's really good for my chronic illness, as washing/drying hair is effort). So, when a product is making it greasy and no amount of dry shampoo can save me, I'm not a fan. Lee Stafford's CoCo LoCo Shampoo and Conditioner don't do that at all, I haven't had to switch up my hair washing routine (praise whatever deity you wish), and although coconut oil is one of the main ingredients to help nourish and repair damaged hair, it doesn't nourish it to the point that it needs washing a day later. My hair feels clean and so incredibly soft after it's dried and I've received loads of compliments on how shiny and healthy it looks. Not only that but it smells delicious, my whole house (we have a tiny little bungalow) smells like a tropical island once I've showered with these glorious products. I've already bought more because I can't be without it. This is a pretty unique product as it's a solid balm that melts into an oil once warmed up in your hands - it's practically perfect for travelling. It's an 'everything' product as it can be used on wet or dry hair, and it moisturises, protects and adds shine to hair. I've used it when my hair was both wet and dry; I like to run it through the ends of my hair as they can get quite damaged. It's great to add a glossy shine to your hair when it's perfectly straight and to flatten out or control any fly-away wispy hairs that won't stay in place. I haven't repurchased this as I've hardly made a dent in it but I probably will. I pretty much loved these products before I tried them, the coconut won me over. But then after testing them out, I really loved them. They're so good, my hair has never felt healthier or looked better, it's just constantly got an intense shine to it and I'm a fan. *Warning* Whilst showering you will end up singing the Pina Colada song. 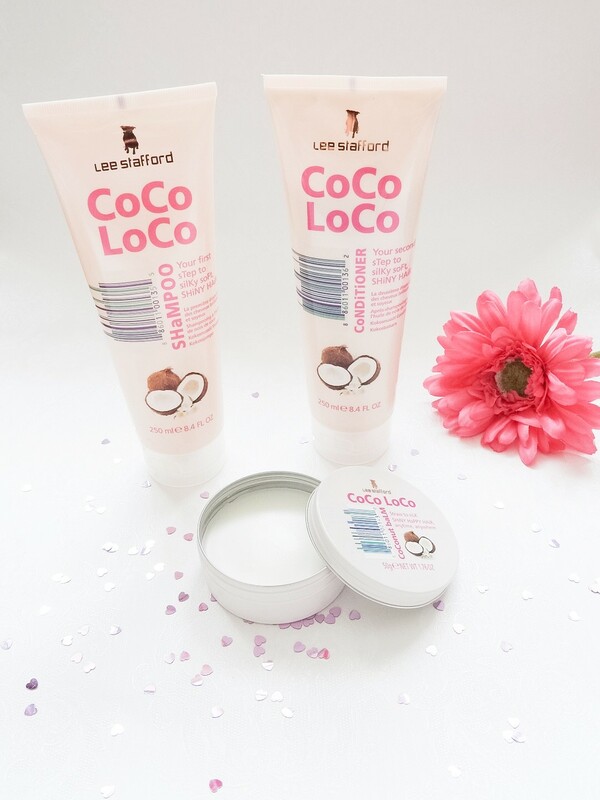 Have you tried anything from Lee Stafford's CoCo LoCo range? * Disclaimer: I was sent these items free of charge in exchange for an honest review. I received no payment for this post and all opinions are 100% my own. My dry, wavy hair tends to frizz in damp, wet or humid weather. I've spent a fortune lately on salon hair products and cheaper shampoos and conditioners, after discarding the contents after one session. However I saw Coco Loco in Boots this week, used the shampoo and conditioner this morning and I'm amazed. My hair feels as soft as when I've come away from the hairdresser after spending extra on a treatment. Keeping my fingers crossed that it feel the same after a night's sleep.